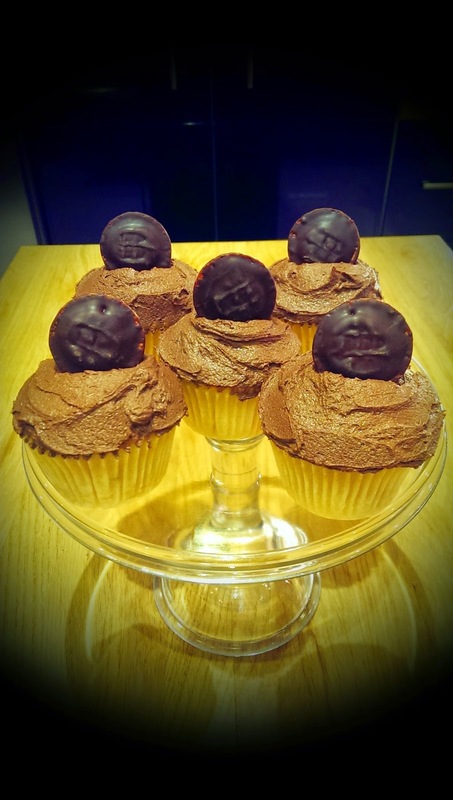 I love cake (love da cake), but Mr. F's not fussed so I don't bake that often as I have to eat it all myself, and let's face it - there's only so many cupcakes a girl can get through on her own. 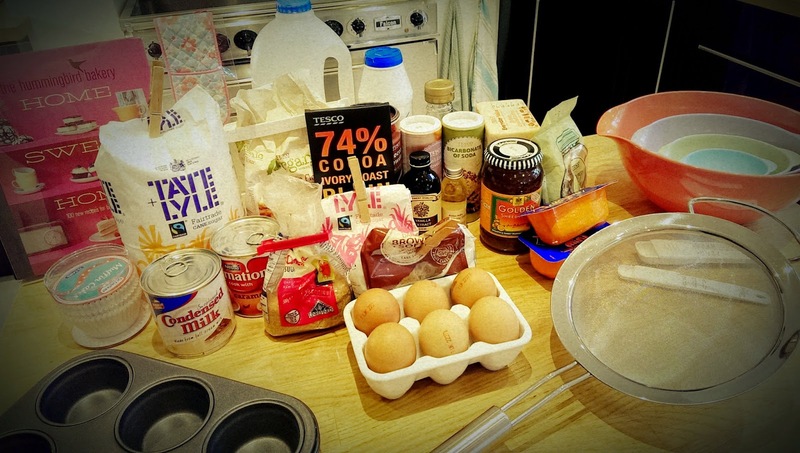 Anyway, Mr. F has found a (virtually) calorie-way of fulfilling my baking cravings - I make cake and he takes it in to work! He recently moved floors in his office and to curry favour with his new colleagues he asked me to do a bumper bake for him to take in. So I dusted off my mixer, did a monster Tesco shop and got stuck in. As with any kind of cooking, good preparation is the key to stress-free success. I like to get out all of my ingredients and tools and line them up so that I know that I have everything I need. I also make sure that the dishwasher is empty and put away each ingredient as I finish with it so that when I'm done the kitchen's virtually already tidied up. I'm a "kit" person. From make-up brushes to baking - I want all the gear whether or not I have any idea! 1. I am officially in love with my Candy Apple Red KitchenAid mixer. Sitting all gorgeous and shiny on my counter, this machine is a perfect example of both form and function. 2. A set of nesting bowls. I got mine from M&S and their pouring spouts make them very useful in the kitchen. 3. 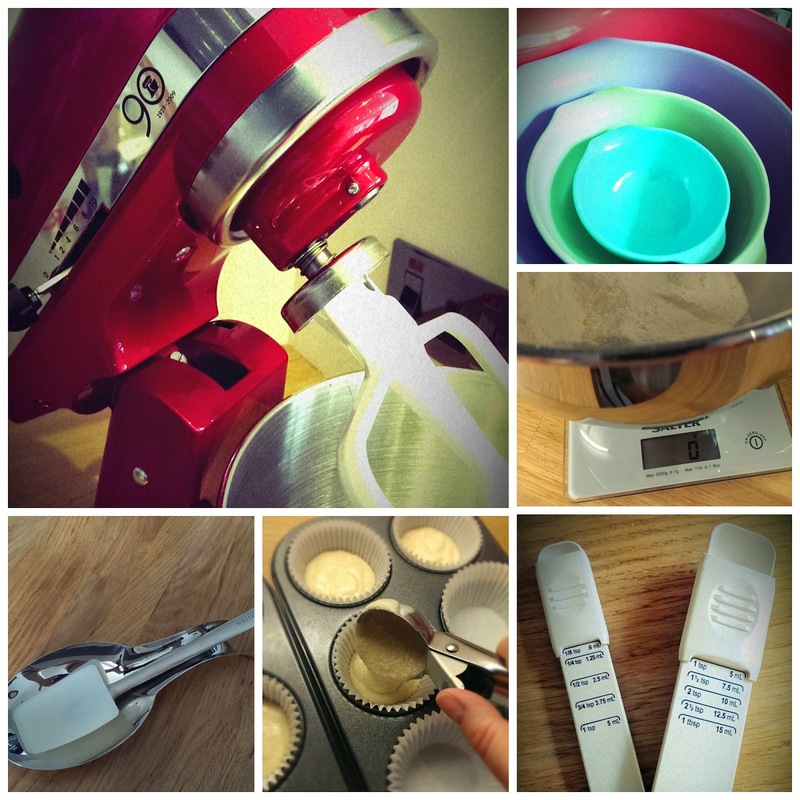 Digital scales for accurate weighing of ingredients - really important when you're baking. 4. My Pampered Chef adjustable measuring spoons - no more guessing percentages of teaspoons - these babies go down to 1/8 of a teaspoon! 5. 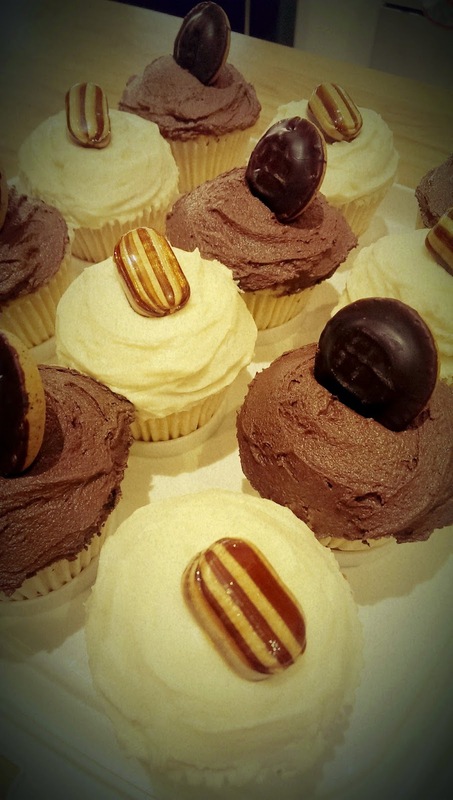 An ice-cream scoop to get even-levelled cupcakes. 6. San Francisco is probably my favourite city in the world, not least because it houses 3 storey kitchen-ware shop Williams-Sononma, which is where I got my Spoonula. A what-u-la?? A spoonula - once youget one you realise you can't live without one. It's a silicone spoon-shaped spatula - perfect for spooning out your cupcake / biscuit batter and cleaning the sides of the bowl at the same time. And the best thing is that Williams-Sonoma now ship to the UK - get your spoonula here - trust me, you won't regret it (disclaimer: Bella Forcella cannot be held responsible for any hours lost on this website or money thereafter spent). My spoonula is sitting in a large spoon rest which saves your work-top from getting covered in baking goo. 7.Cooling racks - again from Pampered Chef. These have fold-up legs which means that you can store them away nice and neatly. They also designed to stack on top of each other so they're great if you don't have a lot of counter space! 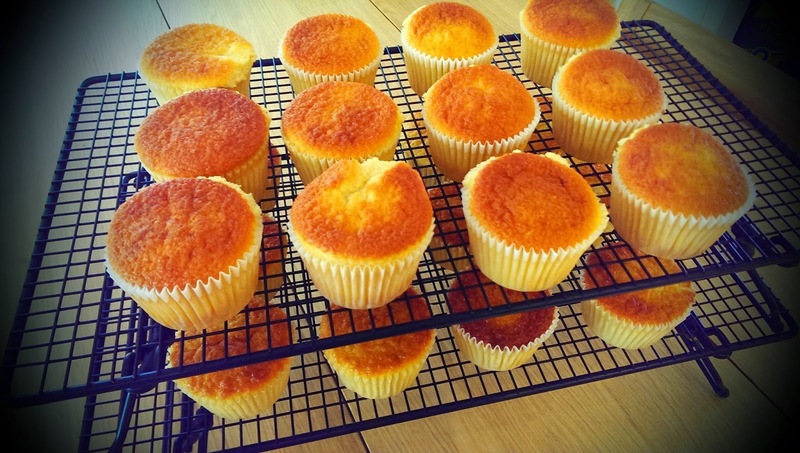 My bake-a-thon began with making the sponges for the cupcakes. I chose my trust Hummingbird Bakery Home Sweet Home cookbook (you can get this for £5 at Amazon) - I find the recipes always work beautifully, however there always seems to be twice as much frosting as you need but this does freeze well. 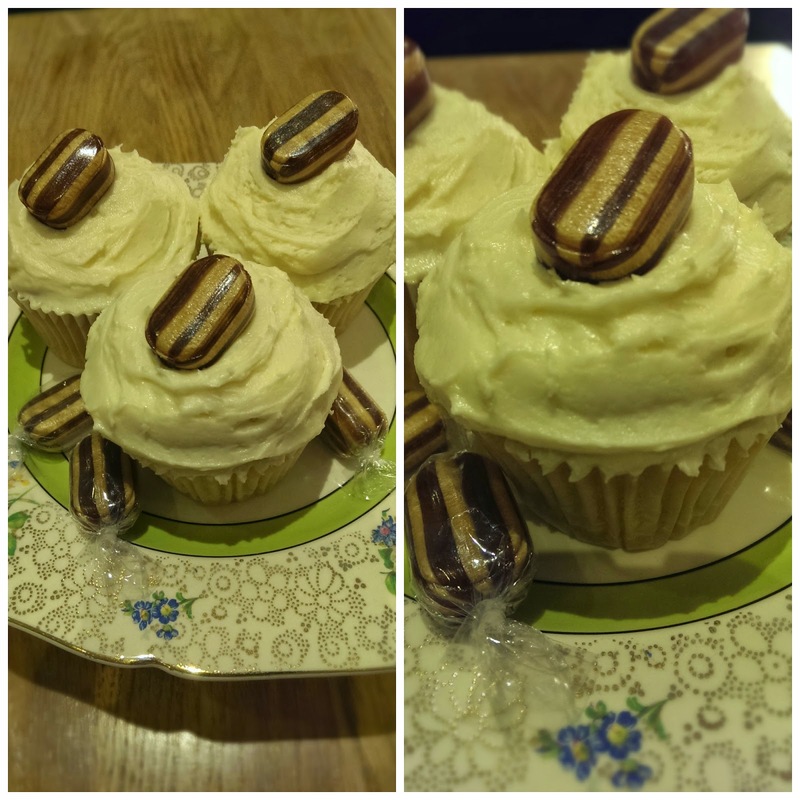 I made the Jaffa Cake cupcakes (recipe here) and a batch of Mint Humbug cupcakes (recipe here), which unusually combines caramel and mint flavours for delicious results! 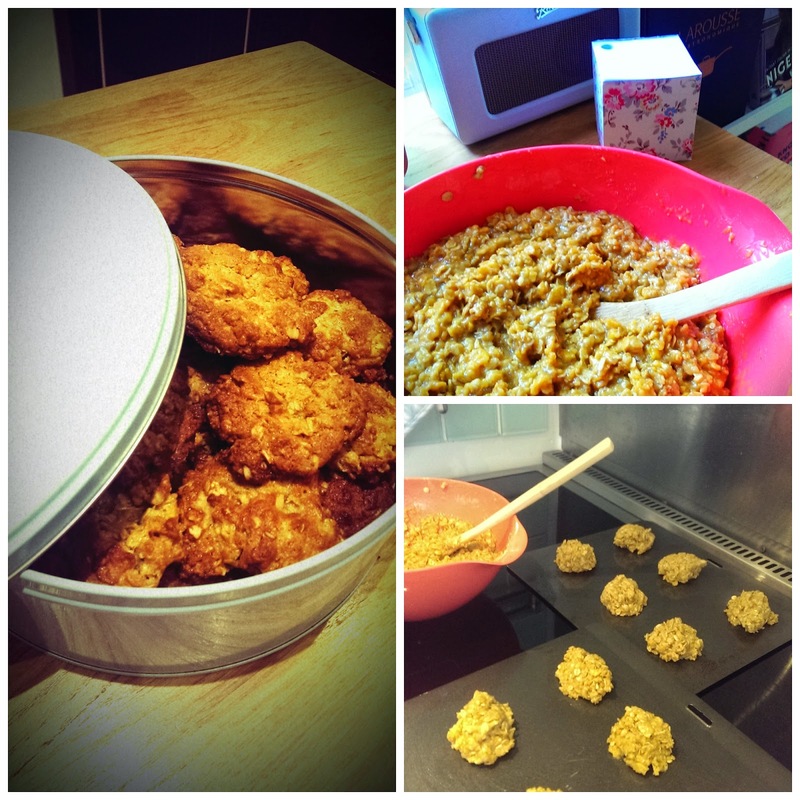 I then made some Syrup Crunch Cookies, again from the Home Sweet Home book (recipe here) and finally some of my trusty chocolate oat cookies. 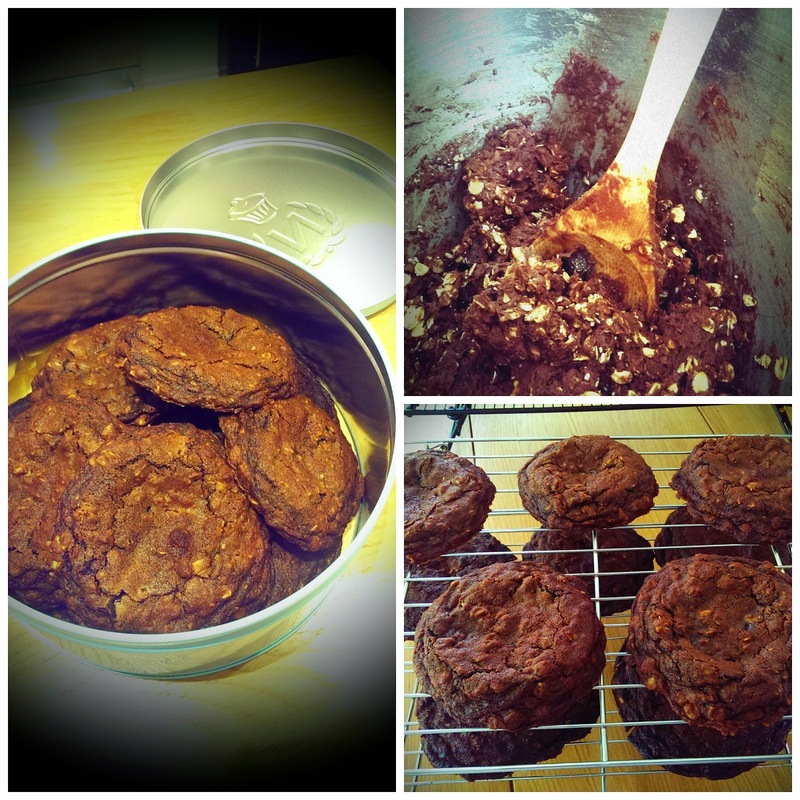 I put my own twist on the recipe by using espresso powder instead of cinnamon, which I much prefer as an accompaniment to the chocolate flavour. Of course I have a whole different set of kit for presenting and transporting my baking! 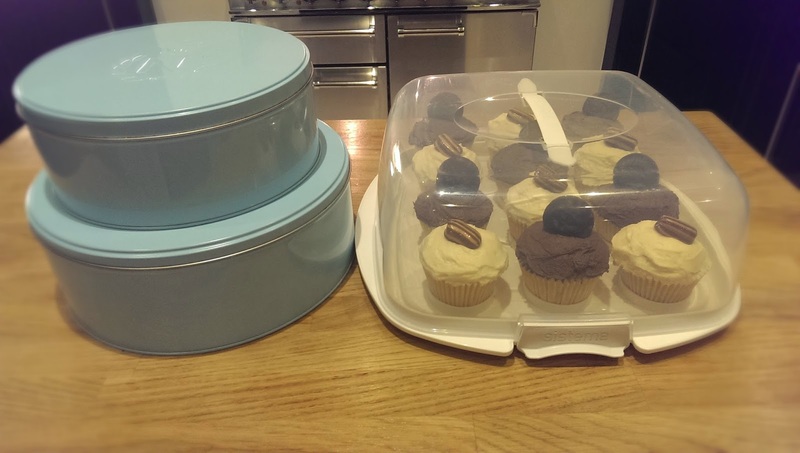 I have my Nigella nesting cake tins, which are great for biscuits or cakes which don't have a lot of decoration and I have a fantastic dual-use cake carrier - one side of the base is flat and the other side has little holes to sit your cupcakes safely inside so that they don't move around when you move them!! When not in transit, my cupcakes are displayed on vintage cake stands - the pretty gold and green patterned stand was my Grandma's and I picked up the clear stand from a charity shop for a couple of pounds. I think that's called baking your cake and eating it!! My mouth is watering reading this post! Delicious!